Meister, Chad and James K. Dew Jr, eds. 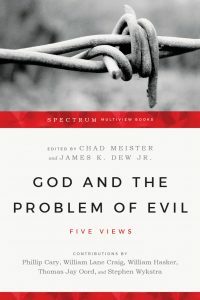 God and the Problem of Evil: Five Views. Downers Grove: InterVarsity Press, 2017, pp. 196, $25.00. The Spectrum Multiview book series by InterVaristy Press considers a topic, and allows experts on the topic to present their views and interact with one another. In this volume, the question of the nature and existence of God is debated in light of the existence and nature of evil. Each author is given the chance to set out their own view. Then at the end of the book, each author has an opportunity to engage, criticize, and develop their thoughts on the views of the other authors. Personally, I find this format very useful for going deeper into theological and philosophical issues. Chad Meister and James Dew have done an excellent job at finding authors that have well-developed views that are quite distinct from one another. Further, they have selected authors who have made interesting, and significant contributions to this issue. 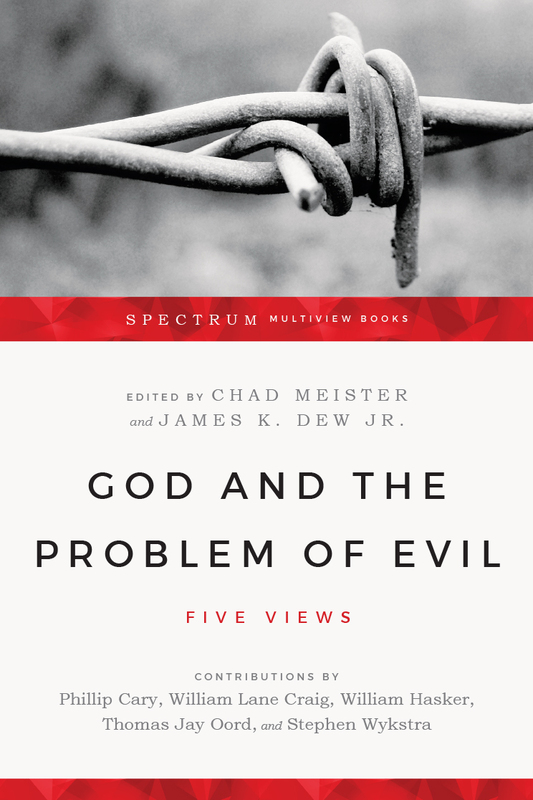 Readers who are fairly new to the problem of evil will be well-served by starting with this volume, and then following up by reading other works by each contributor. The experts in this volume are as follows: Phillip Cary, William Lane Craig, William Hasker, Thomas Jay Oord, and Stephen Wykstra. Other than Phillip Cary, I am quite familiar with the works of the contributors on the problem of evil. Given my familiarity with the contributors’ previous work, I can offer a particular praiseworthy feature of this volume. One impressive feature of this volume is that each contributor has done an excellent job of summarizing their work into a single essay. For example, William Hasker and Thomas Jay Oord each have previous book-length treatments of the problem of evil. Yet each author gives a clear and concise statement of their views. Readers will get an excellent introduction to the thought of each author, and have a serious launching pad for going deeper into their work. Before delving deeper into the book, I wish discuss one important caveat. The title of the book might suggest that there is one problem of evil, but the book makes it very clear that there is no such thing as the problem of evil. Instead, there are many different issues related to the nature of God and evil that every Christian must consider. This is made clear in the introduction of the book as well as in each contributor’s chapter. Each author clearly lays out what the particular problem of evil that he wishes to focus on, and then articulates his response accordingly. With that caveat out of the way, allow me to discuss each contributor’s essay. Phillip Cary offers what he calls the “Classic View,” which is represented by such historical figures as Augustine, Thomas Aquinas, and C. S. Lewis. Cary notes that classical Christian theists have not, historically, asked questions like, ‘If evil exists, how can God exist?’ Instead, classical Christian thinkers were troubled by a different question: ‘Since God is perfectly good, how is evil possible?’ According to Cary, evil exists because God has a good reason for permitting it to exist. This ‘good reason’ is intrinsically connected to a greater good that God will bring out of the occurrence of that evil. Throughout Cary’s essay, readers will encounter a careful and nuanced articulation of Augustinian and Thomistic ideas such as that evil is the privation of the good, and that it is impossible for God to create creatures who are incorruptible. One interesting feature of Cary’s view is that God is never “off the hook” for the existence of evil in the world. For Cary, God can be held responsible for the existence of evil since God permits every instance of evil. However, Cary maintains that God cannot be held culpable for evil since God has a good reason for permitting it. William Lane Craig presents a “Molinist View,” whereby God possesses exhaustive foreknowledge of what creatures would do in any possible circumstance that they might be placed in. Craig makes careful distinctions between different kinds of intellectual and pastoral problems that a Christian apologist should consider. Some versions of the problem of evil focus on the alleged internal incoherence of Christian belief, whilst others present evil as external evidence that the Christian God does not exist. Craig presents each argument, and explains how Molinism can, or cannot, help rebut each objection. William Hasker offers an “Open Theist View.” On open theism, God does not have exhaustive foreknowledge of the future because the future is open. God does possess an exhaustive knowledge of what creatures might do, and probably will do, in the future, and He uses this knowledge to providentially guide creation towards His intended purposes. Hasker offers an important contribution to this discussion by making a distinction between two kinds of theodicies: a general-policy theodicy and a specific-benefit theodicy. On a general-policy theodicy, God’s permission of certain evils is justified on the basis of God adopting a good general policy for creation. For example, God might desire to create a universe that is life-sustaining, and that requires that God create a universe with regular laws of nature. A universe with orderly laws of nature is a great good, but it does entail the possibility of natural disasters like hurricanes. In contrast, a specific-benefit theodicy focuses on the justification for God permitting a particular instance of evil—i.e., whatever specific greater good that arises from that particular instance of evil. In Hasker’s essay, he develops a robust general-policy theodicy that is well-worth considering. Thomas Jay Oord offers what he calls the “Essential Kenosis View.” Oord does not find most attempts at theodicy satisfying in the least. Theodicies always leave him thinking, ‘God, you could have prevented this evil from happening.’ In light of this, Oord develops a theodicy on which God could not have prevented evil from happening, thus getting God ‘off the hook’ for the existence of evil. On Oord’s understanding of God, love is God’s primary attribute. God’s love is necessarily self-giving and uncontrolling. What this means is that God necessarily gives life and freedom to others, and this is not something that God can revoke. God essentially and eternally gives freedom, agency, self-organization, and law-like regularity to creation. It is not possible for God to ever override or revoke these gifts. What this means is that God cannot intervene to prevent evil. Instead, God can only call all of creation to a life of righteousness. In the final essay, Stephen Wykstra presents a “Skeptical Theist View.” Wyskra is personally responsible for starting this particular response to the evidential problem of evil in the 1980s. The evidential problem of evil tries to say that certain instances of evil give us good evidence for thinking that God does not exist. The Skeptical Theist response argues that we are not warranted in making an inference from some particular instance of evil to the conclusion that God does not exist. This essay shows a great deal of nuance, and would serve as an excellent source in any philosophy of religion syllabus. When it is all said and done, God and the Problem of Evil offers a lucid, emotionally sensitive, and diverse set of essays on the problem of evil. It would serve well for pastors, students, and small groups who are looking for a place to start their journey into this issue, or for people who are wishing to go a bit deeper in their reflection on God and evil.